The application of fibrinolytic therapy in acute myocardial infarction is generally practiced to reduce the associated morbidities; however, there are rare reports of pulmonary hemorrhage attributed to the use of fibrinolytic therapy throughout the literature. In this case report, we present a 45-year-old man who developed pulmonary hemorrhage after administration of streptokinase for the treatment of acute myocardial infarction. A 45-year-old male with no history of ischemic heart disease presented to the emergency department 45 min after the onset of retro-sternal chest pain which radiated to the left arm and accompanied with cold sweating. His past medical history was only indicative of cocaine and tobacco abuse for several years. Initial physical examination demonstrated a blood pressure of 145/90 mmHg, heart rate of 94/min, respiratory rate of 18/min, oral temperature of 37.4°C and oxygen saturation 95% while he was breathing ambient air. Heart and lung examinations were unremarkable. On admission, the electrocardiography revealed sinus rhythm and elevated ST segment in V1-V4 leads and depressed ST segment in II, III, AVF, V5 and V6 leads, well-suited with the diagnosis of acute antroseptal myocardial infarction. Bed-side echocardiography showed ejection fraction of about 35% and antroseptal akinesia. The patient was immediately transferred to the intensive care unit for cardiac monitoring and thrombolytic therapy. Pain was alleviated with nitroglycerine and morphine. An intravenous infusion of 1.5 million units of streptokinase over 50 min, followed by heparin at 900 U/h and one 325 mg tablet of aspirin and one 75 mg tablet of clopidogrel were administered. Results of laboratory evaluation included normal levels of electrolytes and glucose. The blood urea nitrogen level was 16 mg/dl and the creatinine level was 1.3 mg/dl. The alanine aminotransferase level was 64 U/l (reference range: 8-40), the aspartate aminotransferase level 180 U/l (reference range: 8-30), the alkaline phosphatase level 130 U/l (reference range: 35-125), total bilirubin level 0.8 mg/dl (reference range: 0.2-1.2 mg/dl), the albumin level 4.4/dl (reference range: 3.7-5.5), and the total protein level 7.3 g/dl (reference range: 6.0-8.0). The white blood cell count was 11,000/mm 3 , the hematocrit was 45.9% and the platelet count was 218,000/mm 3 . Also, creatinine kinase myocardial bound/creatinine kinase equal to 597/8932 U/l and elevated troponin-I level equal to 29 ng/ml were recognized. After 8 hours of admission, the patient gradually developed shortness of breath, hypoxemia and fever (38.5°C) and after 3 h later, cough and hemoptysis developed. Bed-side chest X-ray showed bilateral basal alveolar infiltrates. Finally, endotracheal intubation and mechanical ventilation was necessitated when hypoxemia (SaO 2 = 78%) and symptoms of respiratory distress were present with a respiratory rate of 40/min. Laboratory tests showed a fall in the hemoglobin level from 15.8 to 12 g/dl within 20 h, and to 9 g/dl within 48 h; so two units of packed cell were administered. Activated partial thromboplastin time was 99 s. In addition, he received four units of fresh frozen plasma and eight units of cryoglobulin with the purpose of pulmonary hemorrhage control. There was no sign of hematuria or melena. The lab tests of admission time showed normal coagulation, liver and kidney functions tests. No other bleeding site was discovered. On the next day, the patient remained febrile (39.0°C) with constant and moderate hemoptysis. Due to the increased blood urea nitrogen and creatinine during the 72 h after admission, bed-side hemodialysis according to the nephrology consult was done for him with the impression of acute renal failure. Bronchoscopy on the 3 rd day showed no lesion in the bronchial tree and broncho-alveolar lavage was positive for hemosiderin laden macrophages (90%) and negative for acid fast bacillus. Computerized tomography of the chest on the 3 rd day revealed diffuse alveolar infiltrates [Figure 1]. The results of anti-glomerular basement membrane antibody, antinuclear antibodies, anti-double-stranded deoxyribonucleic acid antibody, peripheral antineutrophil cytoplasmic antibodies (p-ANCA), and cytoplasmic ANCA were all negative. The patient was intubated for 9 days with no significant improvement in his condition and in the 10 th hospital day his blood pressure was not detected and cardiac rhythm became asystole; in spite of cardiopulmonary resuscitation for 60 min he remained pulseless and eventually expired. 1. Anderson HV, Willerson JT. Thrombolysis in acute myocardial infarction. N Engl J Med 1993;329:703-9. 2. Levine MN, Goldhaber SZ, Califf RM, Gore JM, Hirsh J. Hemorrhagic complications of thrombolytic therapy in the treatment of myocardial infarction and venous thromboembolism. Chest 1992;102:364S-73. 3. Swanson GA, Kaeley G, Geraci SA. Diffuse pulmonary hemorrhage after streptokinase administration for acute myocardial infarction. Pharmacotherapy 1997;17:390-4. 4. Gopalakrishnan D, Tioran T, Emanuel C, Clark VL. Diffuse pulmonary hemorrhage complicating thrombolytic therapy for acute myocardial infarction. Clin Cardiol 1997;20:298-300. 5. Disler LJ, Rosendorff A. Pulmonary hemorrhage following intravenous streptokinase for acute myocardial infarction. Int J Cardiol 1990;29:387-90. 6. Nathan PE, Torres AV, Smith AJ, Gagliardi AJ, Rapeport KB. Spontaneous pulmonary hemorrhage following coronary thrombolysis. Chest 1992;101:1150-2. 7. Lange RA, Hillis RD. Cardiovascular complications of cocaine use. N Engl J Med 2001;345:351-8. 8. Mittleman MA, Mintzer D, Maclure M, Tofler GH, Sherwood JB, Muller JE. Triggering of myocardial infarction by cocaine. Circulation 1999;99:2737-41. 9. Restrepo CS, Carrillo JA, Martínez S, Ojeda P, Rivera AL, Hatta A. 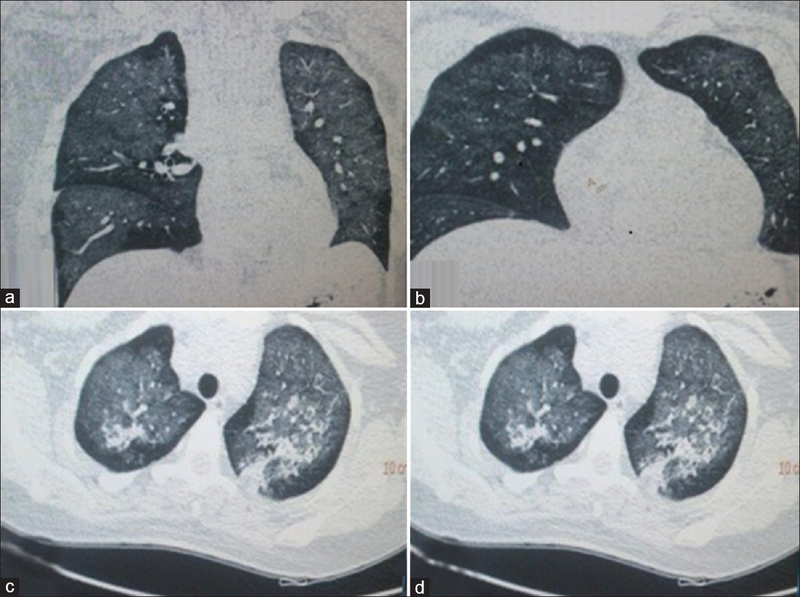 Pulmonary complications from cocaine and cocaine-based substances: Imaging manifestations. Radiographics 2007;27:941-56.